Background: The aim of this study is the effect of stress distribution within the bone with varying implant crest module designs. 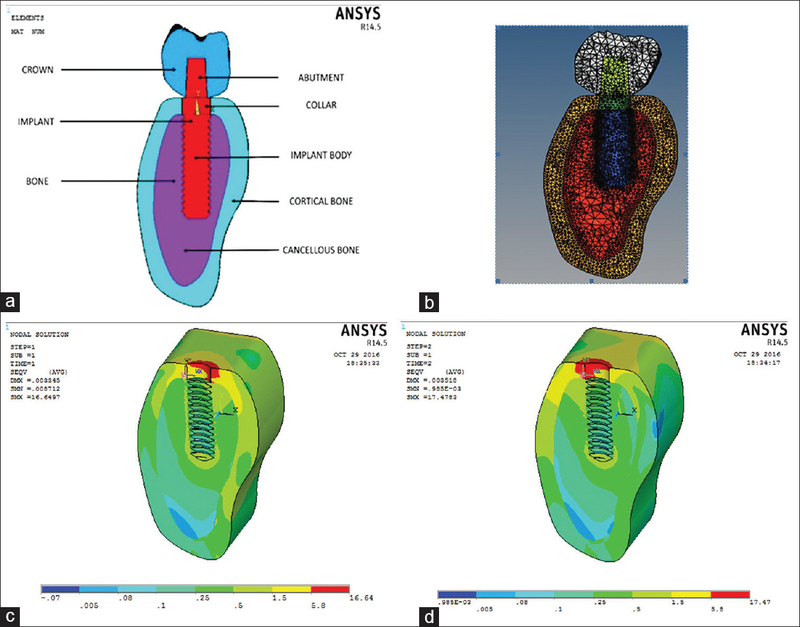 Materials and Methods: Finite element models of a straight two-piece 4 mm × 13 mm screw-shaped threaded implant with divergent, straight, and convergent implant crest module with their surrounding suprastructure embedded in mandibular second premolar area were created with ANSYS software. Different implant crest module designs incorporated in D2 types of bone under 100N axial and 100N at 20° oblique load were created to evaluate stress distribution in the crestal bone around implant crest module. Results: Maximum von Mises stress was observed at the crestal region of the bone and at crest module region of the implants in all the models. Divergent crest module design shows minimum von Mises stress at crestal bone during vertical loading within bone and at implant crest module. Straight crest module designs result in minimum stresses during oblique loading than vertical loading. Convergent crest module design shows maximum von Mises stress. Conclusion: Within limitations of the study, it was concluded that stress distribution in adjacent compact bone is greatly influenced by implant crest module design. Divergent crest module designs result in minimum stresses at crestal bone and in the implant crest module region, followed by straight and convergent crest module in ascending order of stress distribution. A new era for oral rehabilitation began with the introduction of osseointegrated dental implants. The high success rates and long-term follow-up of patients treated with osseointegrated dental implants have attracted the interest of clinicians and researchers worldwide. Possible cause of crestal bone loss could be a local inflammation/infection and mechanical stresses acting on the crestal bone around the implant collar. Implant crest module is the transosteal region of an implant body also called as an implant collar which is designed to accept the prosthetic component in implant system and serve as region which receives the crestal stresses to the implant after loading. Divergent, straight, and convergent implant crest module designs are available nowadays. Implant collar designs are one of the most likely causes of early implant bone loss. The crest module of the implant has a surgical influence, a biologic width influence, a loading profile consideration, and a prosthetic influence. Therefore, this area of the implant body is determinant for the overall implant body design. Misch et al. evaluated that the divergent type of implant collar demonstrates a better stress distribution than a straight collar. Bozkaya et al. suggested that implants with narrowing cross-sections at the top of the cortical bone that is convergent crest module design create more favorable load transfer characteristics for single-tooth implants in this region. Carinci et al. showed that the reverse conical neck implants gave an increased residual crestal bone volume and reduced mechanical stress around an implant neck. Shen et al. analyzed that stress and strain distributions in the adjacent compact bone are influenced by the implant collar design. The divergent collar demonstrated the lowest maximum von Mises and principal stresses and strains in the crestal compact bone contiguous to the implant collar, followed by the straight and convergent collars. Yamanishi et al. evaluated that implant neck design and implant–abutment joint types influence peri-implant bone stresses and abutment micromovement. Costa et al. demonstrated that extended divergent collar designs were found to be the most advantageous, especially in the reduction of cortical bone critical stresses of tensile and shear. Finite element analysis (FEA) is an effective computational tool that has been adapted from the engineering arena to dental implant biomechanics. The components in a dental implant–bone system are extremely complex geometrically; FEA has been viewed as the most suitable tool for analyzing them. Hence, the study was planned to comparatively evaluate the effect of stress distribution at crestal bone and in the implant crest module region with divergent, straight, and convergent implant crest module designs and to determine which implant crest module geometry is more favorable for the preservation of bone. The null hypotheses was that there was no influence of varying implant crest module designs on the stress distribution to the bone. A three-dimensional (3D) finite element model (FEM) of mandibular section representing the second premolar region was modeled with cortical and cancellous bone. The posterior mandible (from distal to first premolar to mesial to first molar) was harvested from a dry human skull. A digital image of a mandible was modeled using 3D CAD design software CATIA v5 R21 [solidwork; Avions Marcel Dassault, France]. D2 type bone was modeled (as per Lekholm and Zarb classification) which is more commonly found bone density in the mandibular posterior region having spongy center surrounded by 2 mm of cortical bone having a length of 24 mm and width of 16 mm. A straight two-piece 4 mm × 13 mm screw-shaped threaded implant was modeled. Implants used in this study were made up of titanium. Implant was divided into implant body and implant crest module, having length of 11 mm and 2 mm, respectively. All implant models had V-shaped thread design of spiral type along implant body length with thread pitch of 0.8 mm and thread depth of 0.25 mm. Three different implant crest module designs straight, divergent, and convergent were constructed having diameter of 4, 4.5, and 3.5 mm, respectively. Rigid straight hex abutment of 4-mm diameter at abutment collar interface and height of 5.5 mm was modeled over the fixture. Mandibular second premolar was modeled as per dimensions mentioned in the textbook of Dental Anatomy with crown framework of cobalt–chromium alloy (0.5 mm thickness) and occlusal surface of feldspathic porcelain (1.5 mm thickness) as given in [Figure 1]a. Figure 1: (a) Graphic representation of model. (b) Meshed model. (c) von Mises stress within bone for straight crest module during vertical loading. (d) von Mises stress within bone for straight crest module during oblique loading. The FEM assumed a state of optimal osseointegration, which means that the cortical and trabecular bone were assumed to be perfectly bonded to the implant. It was assumed that the dental implant had been placed in the mandible after a certain healing period for osseointegration and at the beginning of function. The 3D FEM corresponding to the geometric model was meshed using Hypermesh v11.0 software [ANSYS version 14.5 software] as shown in [Figure 1]b. The type of element suitable for this particular study was noded tetrahedron element which was assigned 4° of freedom per node, namely, translation in the x, y, and z directions. The straight model were constructed with (451690 elements and 83093 nodes), divergent with (453612 elements and 83447 nodes), and convergent with (451912 elements and 83204 nodes). All materials were designated as homogenous, isotropic, and linear elastic. The Young's modulus of elasticity and Poisson's ratio values of materials to be used will be adopted from the literature and are summarized below in [Table 1]. Boundary condition is the application of force and constraint. The boundary conditions were constrained at node on muscle attachment from external oblique line buccally to the mylohyoid ridge lingually. Depending on the hardness of foods, the average bite force reportedly ranges from 20 to 120 N. In the present study, we applied a static load of 100 N to simulate loading by occlusion in reference to some previous studies., A 100N static axial occlusal load and angular load of 100N at 20° from lingual to buccal was applied to the occlusal surface of crown in the central fossa to calculate the stress distribution. The stress levels were calculated as von Mises stresses. A total of three models of implant were prepared which were tested for von Mises stress by applying vertical load of 100 N and angular load of 100 N at 20° in D2 type of bone. von Mises stress values are defined as the beginning of the deformation for ductile materials such as metallic implants. Failure occurs when von Mises stress values exceed the yield strength of an implant material. In the present study, von Mises stress analysis was done with ANSYS classic 14.5software (PA, USA). 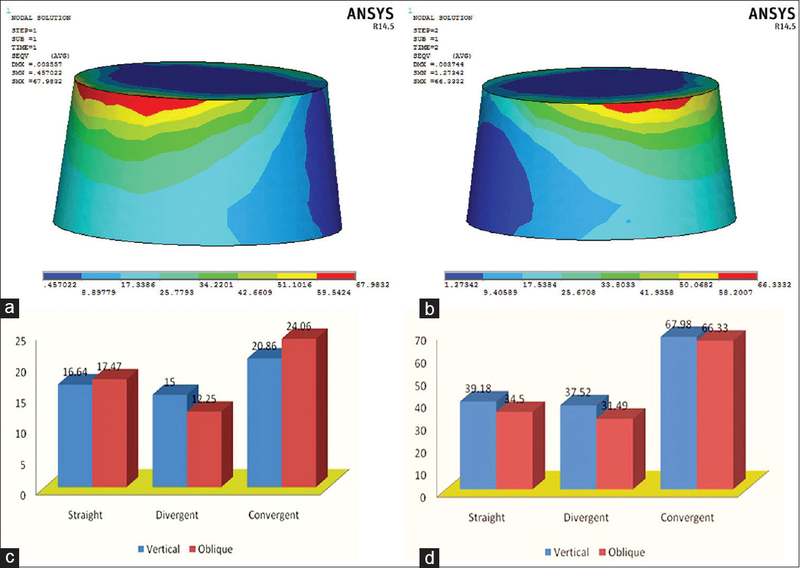 The stress analysis executed by Ansys software provided results that enabled the tracing of von Mises stress field in the form of color-coded bands which represents a particular range of stress value, which is given in Mega Pascal (MPa). [Table 2] shows von Mises stress generated within cortical bone, at implant crest module. Straight crest module design shows minimum von Mises stress during oblique loading at implant crest module than during vertical loading. In D2 type of bone, maximum stresses were 16.64 MPa and 17.47 MPa observed in the coronal part of the bone corresponding to the neck of the implant under vertical and oblique loading, respectively [Figure 1]c and [Figure 1]d. Under both loading conditions, maximum stress was seen at the implant crest module, and it went on decreasing gradually toward the apical part of the implant. Maximum stress with vertical loading [Figure 2]a was 39.18 MPa and it was 34.5 MPa for oblique loading [Figure 2]b. Figure 2: (a) von Mises stress within implant crest module for straight crest module during vertical loading. (b) von Misses stress within implant crest module for straight crest module during oblique loading. (c) von Mises stress within bone for divergent crest module during vertical loading. (d) von Mises stress within bone for divergent crest module during oblique loading. Divergent crest module design shows minimum von Mises stress at crestal bone during vertical loading within bone, at implant crest module. Divergent crest module design shows minimum von Mises stress during oblique loading than vertical loading. In D2 type of bone, maximum stresses were 15.0 MPa and 12.25 MPa under vertical and oblique loading, respectively [Figure 2]c and [Figure 2]d. Maximum stress with vertical loading [Figure 3]a was 37.52 MPa, and it was 31.49 MPa for oblique loading [Figure 3]b in the implant crest module. Figure 3: (a) von Mises stress within implant crest module for divergent crest module during vertical loading. (b) von Mises stress within implant crest module for divergent crest module during oblique loading. (c) von Mises stress within bone for convergent crest module during vertical loading. (d) von Mises stress within bone for convergent crest module during oblique loading. Convergent crest module design shows maximum von Mises stress at crestal bone, at implant crest module in all the models during both vertical and oblique loading. In D2 type of bone, maximum stresses were 20.86 MPa and 24.06 MPa observed in the coronal part of the bone corresponding to the neck of the implant under vertical and oblique loading, respectively [Figure 3]c and [Figure 3]d. Maximum stress with vertical loading [Figure 4]a was 67.98 MPa and it was 66.33 MPa for oblique loading [Figure 4]b at implant crest module region. Figure 4: (a) von Mises stress within implant crest module for straight crest module during vertical loading. (b) von Misses stress within implant crest module for straight crest module during oblique loading. (c) von Mises stress within bone for divergent crest module during vertical loading. (d) von Mises stress within bone for divergent crest module during oblique loading. The stresses calculated were used for the comparison between implant crest module designs. It was then drawn in to graphs to represent them. It was observed that the stresses were maximum in convergent crest module design and minimum in divergent crest module design under vertical and oblique loading within bone and at implant crest module [Figure 4]c and [Figure 4]d.
The design of an implant refers to the 3D structure of an implant system characterized by shape, type of implant–abutment interface, presence or absence of threads, thread design, surface topography and chemical composition. It is believed that the differences between these properties affect the force transfer characteristics of implants. Crest module is that portion of a two-piece metal dental implant, designed to hold the prosthetic components in place, and to create a transition zone to the load-bearing implant body. Its design, position in relation to the alveolar crest, and an abutment–implant interface make us believe that it plays a major role in integration to both hard and soft tissues. Unfortunately, in most clinical conditions, early tissue breakdown leading to soft tissue and hard tissue loss begins at this region. Zarb and Schmitt have stated that bone structure is the most important factor in selecting the most favorable treatment outcome in implant dentistry. Available bone is particularly important in implant dentistry and describes the volume of the edentulous area considered for implants. In addition, bone has an internal structure described in terms of quality or density, which reflects the strength of the bone. Despite the increasing popularity of implant treatment, time-dependent marginal bone resorption around implants is still unavoidable. Implant failure is a source of frustration and disappointment for both the patient and the clinician and hence, strategies for prevention of failure are crucial. Micromovements of an endosteal dental implant and excessive stress at the implant–bone interface have been suggested as potential causes for peri-implant bone loss and failure of osseointegration. In a 3-year longitudinal study of successful dental implants, van Steenberghe et al. reported an average loss of marginal bone of 0.4 mm during the 1st year following implant placement and 0.03 mm/year during the 2nd and 3rd years. Bone is constantly remodeling itself to adapt to external stimuli in the surrounding environment, which is known as bone homeostasis. Wolff observed a direct association between bone form and mechanical loading. His theory entails that with increasing stresses new bone formation occurs, while a decreased stress leads to bone loss. However, Frost redefined Wolff's law after demonstrating that bone resorption also occurs under extreme stresses. In this study, all the optimum conditions were taken into consideration. First of all bone conditions, D2 is chosen as this type of bone most commonly found in the mandibular posterior region. CpTi is used as implant material as it is the most biocompatible material used for any endosseous implants. An engineering principle called the composite beam analysis states that when two materials of different moduli are placed together with no intervening material and one is loaded, a stress contour increase will be observed where the two materials first come in contact. This phenomenon is observed in photoelastic and 3D FEA studies when an implant is placed within a bone simulant and loaded. Results of this study were also in accordance with this principle and show that maximum stresses were concentrated in the cortical bone at the neck of the implant. In FEA, the area of interest, the model (an implant and a part of the mandible in this situation), is split into a mesh of elements. Thus, solution to a complex mechanical problem can be obtained by dividing the problem domain into a collection of much smaller and simpler domains (elements), in which the field variables can be interpolated with the use of shape functions. An overall approximated solution to the original problem is determined based on variation principle. Different materials are defined by their mechanical properties, such as Young's modulus and Poisson's ratio. After defining the load, the problem is solved for each element initially and then a harmonious solution is produced. Misch et al. reported that an implant collar angled by more than 20° with a surface texture increases bony contact and might impose slight beneficial compressive and tensile components to the contiguous compact bone and will decrease the risk of bone loss. They also stated that the divergent type of implant collar demonstrates a better stress distribution. Mandell et al. showed that orthopedic implants that have intramedullary stems with conical angles in a range of 30°–60° have the potential to better maintain bone density and achieve stable fixation. Kitamura et al. demonstrated that lower peak stresses exist in crestal compact bone contiguous to an implant that was in an oblique contact angle with the crestal compact bone to the implant neck rather than in a perpendicular angle. The effect of different implant crest module designs on stress distribution in D2 bone densities has not been studied extensively using FEA. Hence, this study was done using this method of analysis to evaluate the pattern of stress distribution when different implant crest module designs were used. The FE model created in this study was a multi-layered complex structure involving a solid implant and a layered specific crown. It is important to note that the stress in different bone qualities may be influenced greatly by the materials and properties assigned to each layer. The applied forces were static. Vertical as well as oblique forces were considered as the later represents more realistic occlusal forces. The results of the present FEA study revealed that crest module design affects stresses generated in the bone. Maximum von Mises stress was observed at the crestal region of the bone and crest module region of the implants in all the models. The divergent crest module design resists the crestal bone loss, gives better response on mechanical basis. In all conditions, the divergent crest module demonstrated the lowest maximum von Mises stresses in the crestal compact bone contiguous to the implant crest module, followed by the straight and convergent crest module design during vertical and oblique loading. In the present study, the components of the implant models were considered to be single pieces. Furthermore, the wider the platform is, the wider will be the connection of the abutment actually used. The abutment–implant junction on the convergent–collar implant is closer to the compact bone than implants with straight or divergent collars. The stress concentration in the components of the convergent–collar implant may have a greater effect than those of the straight and divergent collars. This may have affected the results of this study. Furthermore, this study used uniform thread profiles, abutments, and prostheses in an effort to compare the different geometries of the implant crest module. In the present study, effects of three different implant crest module designs were studied in D2 bone qualities. To achieve more realistic models and to extrapolate the results clinically, advanced digital imaging techniques can be used to model bone geometry in greater detail; the anisotropic and nonhomogeneous nature of the material needs to be considered; and boundary conditions must be refined. The assumptions which were made regarding model geometry, material properties, applied boundary conditions, and the bone–implant interface can affect the accuracy of the FEA model which is a limitation of all FEA studies. The structures in the model were all assumed to be homogeneous and isotropic and to possess linear elasticity. In the actual situation, human mandibular bone properties were nearly orthotropic, and rarely ultimate strengths were investigated. Cement thickness layer was also ignored. All interfaces between the materials were assumed to be totally bonded or osseointegrated. But in addition, modeling of the bone–implant interface should incorporate the actual osseointegration contact area in cortical bone as well as the detailed 3D trabecular bone contact pattern. In this study, because of the technical limitation, static loads were applied in the FEA instead of dynamic loads. The design of the occlusal surface of the model may influence the stress distribution pattern. In the current study, the locations for the force application were specifically described as central fossa (vertical loading) and lingual cuspal inclines of buccal cusps (oblique loading). However, the geometric form of the tooth surface can produce a pattern of stress distribution that is specific for the modeled form. Within the limitations of this study, the following conclusions were seen that divergent crest module design results in minimum stresses at crestal bone and at implant crest module followed by straight and convergent crest module in ascending order of stress distribution. It may be inferred that the divergent crest module design resists the crestal bone loss, gives better response on mechanical basis, and appears to be a favorable choice for long-term bone maintenance. The crest module is the area of highly concentrated mechanical stress, where bone loss usually occurs due to overload and absence of stimulation or microbial contamination. The crest module design may positively contribute to the reduction of this problem and help to retain the bone–implant stability and osseointegration through the reduction of bone overload and bone stimulation. Papavasiliou G, Kamposiora P, Bayne SC, Felton DA. Three-dimensional finite element analysis of stress-distribution around single tooth implants as a function of bony support, prosthesis type, and loading during function. J Prosthet Dent 1996;76:633-40. Goswami MM. Comparison of crestal bone loss along two implant crest module designs. Med J Armed Forces India 2009;65:319-22. Shen WL, Chen CS, Hsu ML. Influence of implant collar design on stress and strain distribution in the crestal compact bone: A three-dimensional finite element analysis. Int J Oral Maxillofac Implants 2010;25:901-10. Misch CE, Bidez MW, Strong JT. Scientific rationale for dental implant design. In: Misch CE, editor. Contemporary Implant Dentistry. 3rd ed. St. Louis: Mosby; 2008. p. 200-29. Bozkaya D, Muftu S, Muftu A. Evaluation of load transfer characteristics of five different implants in compact bone at different load levels by finite elements analysis. J Prosthet Dent 2004;92:523-30. Carinci F, Brunelli G, Danza M. Platform switching and bone platform switching. J Oral Implantol 2009;35:245-50. Yamanishi Y, Yamaguchi S, Imazato S, Nakano T, Yatani H. Influences of implant neck design and implant-abutment joint type on peri-implant bone stress and abutment micromovement: Three-dimensional finite element analysis. Dent Mater 2012;28:1126-33. Costa C, Peixinho N, Silva JP, Carvalho S. Study and characterization of the crest module design: A 3D finite element analysis. J Prosthet Dent 2015;113:541-7. Geng JP, Tan KB, Liu GR. Application of finite element analysis in implant dentistry: A review of the literature. J Prosthet Dent 2001;85:585-98. Holmes DC, Loftus JT. Influence of bone quality on stress distribution for endosseous implants. J Oral Implantol 1997;23:104-11. Sevimay M, Turhan F, Kiliçarslan MA, Eskitascioglu G. Three-dimensional finite element analysis of the effect of different bone quality on stress distribution in an implant-supported crown. J Prosthet Dent 2005;93:227-34. 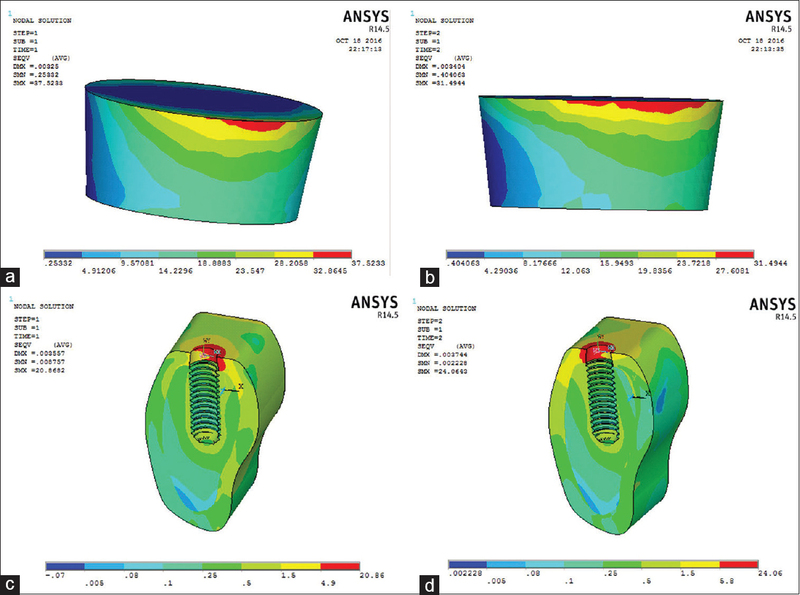 Sertgöz A. Finite element analysis study of the effect of superstructure material on stress distribution in an implant-supported fixed prosthesis. Int J Prosthodont 1997;10:19-27. Dittmer S, Dittmer MP, Kohorst P, Jendras M, Borchers L, Stiesch M, et al. Effect of implant-abutment connection design on load bearing capacity and failure mode of implants. J Prosthodont 2011;20:510-6. Cehreli M, Sahin S, Akça K. Role of mechanical environment and implant design on bone tissue differentiation: Current knowledge and future contexts. J Dent 2004;32:123-32. Aparna IN, Dhanasekar B, Lingeshwar D, Gupta L. Implant crest module: A review of biomechanical considerations. Indian J Dent Res 2012;23:257-63. Zarb GA, Schmitt A. Implant prosthodontic treatment options for the edentulous patient. J Oral Rehabil 1995;22:661-71.
van Steenberghe D, Klinge B, Lindén U, Quirynen M, Herrmann I, Garpland C, et al. Periodontal indices around natural and titanium abutments: A longitudinal multicenter study. J Periodontol 1993;64:538-41. Wolff J. The Laws of Bone Remodeling. Berlin: Springer; 1892. Frost HM. Skeletal structural adaptations to mechanical usage (SATMU): 1. Redefining Wolff's law: The bone modeling problem. Anat Rec 1990;226:403-13. Misch CE. Stress treatment theorem for implant dentistry. In: Misch CE, editor. Contemporary Implant Dentistry. 3rd ed. St. Louis: Mosby; 2008. p. 77. Geng JP, Ma QS, Xu W, Tan KB, Liu GR. 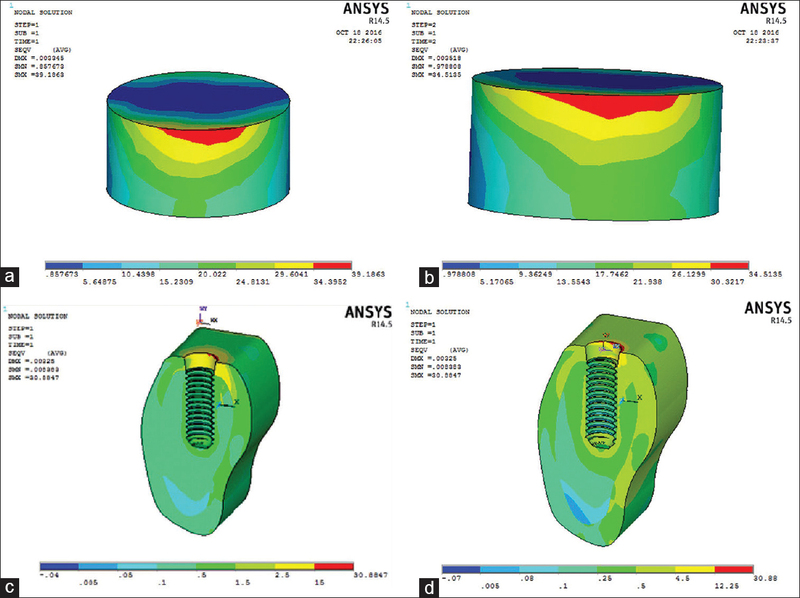 Finite element analysis of four thread-form configurations in a stepped screw implant. J Oral Rehabil 2004;31:233-9. Mandell JA, Carter DR, Goodman SB, Schurman DJ, Beaupré GS. A conical-collared intramedullary stem can improve stress transfer and limit micromotion. Clin Biomech (Bristol, Avon) 2004;19:695-703. Kitamura E, Stegaroiu R, Nomura S, Miyakawa O. Influence of marginal bone resorption on stress around an implant – A three-dimensional finite element analysis. J Oral Rehabil 2005;32:279-86.